While there are numerous treatments that can restore missing teeth, dental implants are simply in a class of their own. They actually restore both the root of a tooth as well as the visible portion, delivering the most natural-looking and reliable results possible. With them, we can replace any number of missing teeth, and thanks to Dr. Rairigh’s extensive training, he can actually handle the entire procedure from start to finish in order to streamline your process. If you’re ready to get rid of the gaps in your smile, dental implants can help you do it, so contact us today for an appointment. 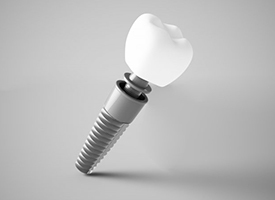 A dental implant is actually a small titanium post that is placed directly into the jaw to act as a new tooth root. There, it not only provides an extremely stable base for replacement teeth, but it also can prevent and even reverse the bone loss that is so common after tooth loss. 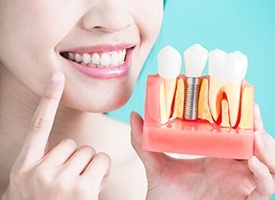 In order to get dental implants, you will first need to undergo a minor surgery. Dr. Rairigh can do this in-house, and once it is completed, you’ll be given a few months to heal before you return to our office to receive your final replacement teeth. Planning the surgical placement of new dental implants is an important process, as we want to ensure the best outcome possible for patients. That’s why Dr. Rairigh will use state-of-the-art Cone Beam technology to supplement his approach, capturing highly detailed, three-dimensional images of the teeth, jaw, and related bone structures. Our team will be able to closely examine the proposed implant site and also make sure to avoid structures like sinuses, nerves, and nearby teeth. The result? Healthier, longer-lasting tooth replacement! While virtual images and models are extremely helpful when planning surgical implant placement, a physical guide can also provide valuable benefits to Dr. Rairigh and his team. After confirming every aspect of the treatment process (such as the location, the angle, and the size of the placed implant) through a digital guide, we will export it to our 3D Printer. The new, physical appliance is completely safe for oral contact and will be used by our team throughout the actual procedure to ensure that the plan is followed to the closest degree possible. As we touched on above, dental implants can be used to replace any number of missing teeth. 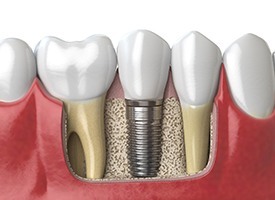 For a single tooth, we’ll use what is called an implant-retained crown. This will consist of a custom-made, all-porcelain crown that is attached directly to an implant using a metal connector called an abutment. This will make it just as strong and stable as the surrounding teeth, and the porcelain will ensure that it looks completely natural as well. You’ll even be able to maintain it just like your other teeth with regular brushing and flossing. For someone who is missing a few teeth in a row, these implant crowns can also be used to support a bridge. Two crowns will be placed on either side of the space in a person’s smile, and these will be bonded to prosthetic teeth. Compared to a traditional bridge, implant-retained bridges have a better hold, last longer, and look more natural as well. More Stability: Implant-retained dentures are much less likely to slip and slide around the mouth compared to removable dentures. More Consistency: Thanks to the support provided to the jawbone by the implants, the denture will maintain its initial fit for much longer. More Natural: Implant-retained dentures typically do not need to be removed, and the prosthetic itself tends to be much smaller, offering a more lifelike result overall. 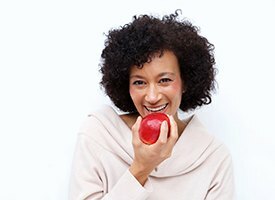 More Bite: Patients with implant-retained dentures will also enjoy a much stronger bite compared to normal ones, allowing them to eat a wider variety of foods with relative ease.